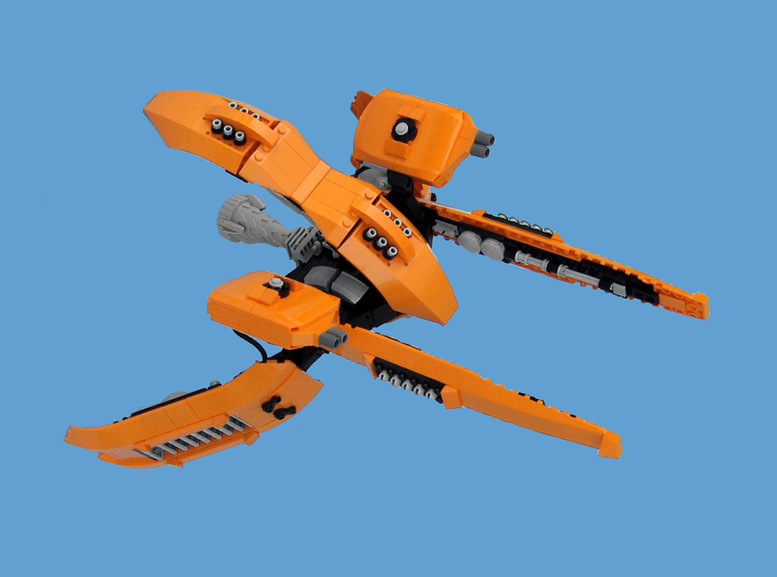 "CrashSanders" with FTL, is one of the few Lego builders who has reached 10,000 support with a Cuusoo project. Well before FTL however, CrashSanders was one of Cuusoo's earlier adopter and I admired his surprisingly articulated small scale mecha and highly detailed futuristic vehicles. I formed a working relationship with him when he spontaneously provided me with some awesome ships for the project closest to my nostalgic gaming heart, Star Control. Later CrashSanders came to me with an idea for a similarly modeled project: minifig plus microbuild ship (which is of course inspired by the Star Wars Planets line), but instead of a game from the 90's, this one was to be based on the Rogue-like game FTL which, unlike Star Control, is currently in vogue. 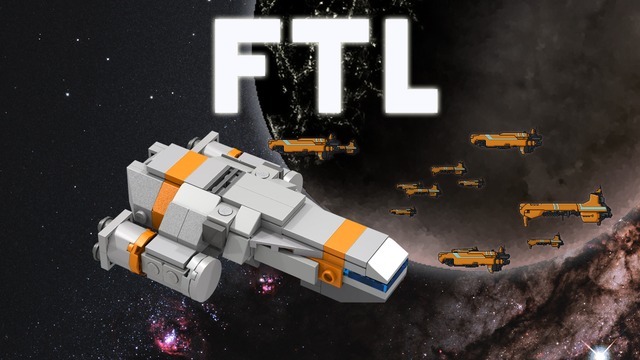 I immediately jumped at the chance to work with such a talented Lego builder and generous Cuusoo contributor and thus the FTL Cuusoo project was started in earnest. As any of my readers likely knows FTL was not picked up for production. CrashSanders and I are currently working on producing instructions for the building of the wide array of ships, with the blessing of Subset Games. The name is Artemiy Karpinskiy, I am 22 years old, from Russia. Currently reside in Sochi, my home city is Moscow. 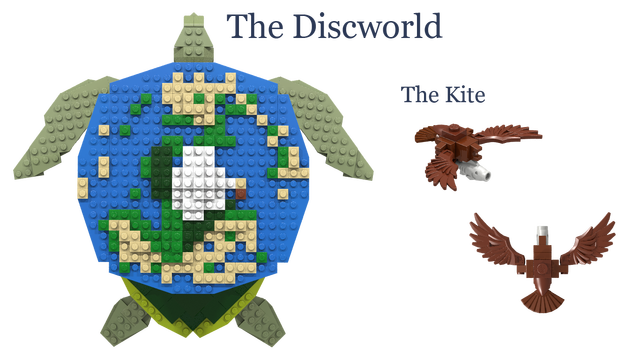 I have a Flickr photostream, long- forgotten MOCPages account, DeviantArt gallery, and a Brickshelf gallery. When did you first become interested in LEGO bricks? Well, I love Lego as long as I remember myself. My elder brother was the first one to collect Lego (he is currently 28, and back there I was barely 4 y.o. and he was 10). What LEGO builders do you admire? How do they inspire you? For the most part, I admire anything that I will consider a good design. From such a giants of LEGO MOCing as Nnenn, Kwi-Chang, Izzo, to some not so famous guys that just do admirable job with what they have. For example, Garry_Rocks from Flickr. He's also from Russia and his main tool of MOCing is Lego Digital Designer. His level of detail is beyond my own, his power suits, mechas, battle vehicles and space ships are just so well done! Also Sunder_59 is worth mentioning. Another Russian digital builder like myself or Garry, he has some stunning space ship designs with tons of bricks in them. What inspires your Lego building process? Well, more than LEGO bricks I actually liked Bionicle parts. Always was a huge Bionicle fan since it's been released back in 2001. Wrote fan-fictions, made drawings, built a considerable amount of MOCs. I liked the stories behind those bricks more than the actual bricks, and always liked to tell stories of my own. Do you have a favorite official Lego set? Theme? Bionicle, without a doubt. And not just because of the sets, but the story and characters that these sets allowed to tell! This was some great and epic saga. Also when I was a kid, I loved Spyrius, Space Police 2, Rock Raiders, Insectoids, Ice Planet, Exploriens and UFO... All of them! From the more modern lines I liked Mars Mission and Exo-Force. Are you a member of a LUG ? Yes, I am member of Russian Lego Community DoubleBrick.ru and EuroBricks.com. Also I was in Russian Bionicle Community (RusBionicle.com) but after the theme was closed I lost need in such a specific community and I moved to DoubleBrick. How did you get started in the Cuusoo community and what does that community mean to you? Well, I can't remember actually how I found the CUUSOO for the first time. But my first project was the Macrofigures (it is now deleted). The overall concept of them was to make a brick-built action figures, but since it was strongly inspired by Minecraft, I failed to make anything beyond the Minecraft-based and few generic designs. For me CUUSOO is a big chance for someone to declare oneself, to have a chance to embody a set of his dream, an idea that the one wants to share with the entire world. What is your motivation behind posting to Cuusoo? For me it is a chance to prove my worth, to fulfill my childhood dream to be a part of Lego, to be a Lego designer. At least, to some degree. What have you learned from your time on Cuusoo? That not every crazy dream or idea is suitable for CUUSOO. That you need to put some effort to give your project an appropriate look and content. That only small number of individuals could fight their way to the top on their own. The team work is vital, essential. If you don't have a team, you can always try your luck to find a mentor. A senior member that is more experienced and could help you in any way possible. I was very lucky to meet GlenBricker. Our collaboration proved to be fruitful. I had a role of a designer, when Glen was a PR manager of sorts. He helped me to be in touch with the community, and gave me numerous advises about proper look and content. What are your favorite projects on Cuusoo, besides your own of course? I think that would be any NickRoyer's projects (Space Troopers, Hyperborea), Ur-Quan Masters (since I did a great deal of help with making ships for Glen), Brickthing's The Adventures of Steamrod, and of course Macross Valkyrie projects by daikoncat and maxvf1. I have always appreciated the depth of detail you have achieved with relatively small builds. Do you have any advice for people who would like to improve their microbuilding technique? Well, I am not as good adviser as I am builder, haha. I think the most basic advise I can give is to follow the shape if you are trying to embody a non-Lego design in Lego. 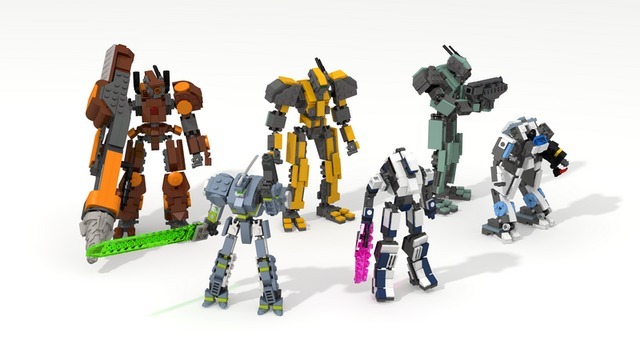 Also if you work in LDD always think how your MOC will feel in your own hands, what is more efficient way to connect one part to another. And don't give up trying, eventually you will find something that is close enough and will satisfy you. Cuusoo is no longer telling anyone outside the company why they pass on a project. Does this bother you? Yes, it bothers me. It makes disappointment even bigger, but I learn to deal with it. Occasionally, I see people talking about have they spent a "whole evening" working on their Cuusoo project. Do you have any idea how much time you spent working on FTL? Oh, evenings and evenings. At least, an evening per ship. What was the best part about taking a project to 10,000? Excitement of the community, feel of people that needs you and you project, overall hype and of course anticipation. What was the worst part of it? Worst part is Review phase, because that's when you are out of control. All you can do - sit tight and being all ears. And then a three or even more months of wait. It kills me at the very beginning and the very end. You have a ton of great content posted on Flickr that you have not posted to Cuusoo. What criteria do you use to decide what you will and will not post? Not every MOC I create is supposed to come on CUUSOO. 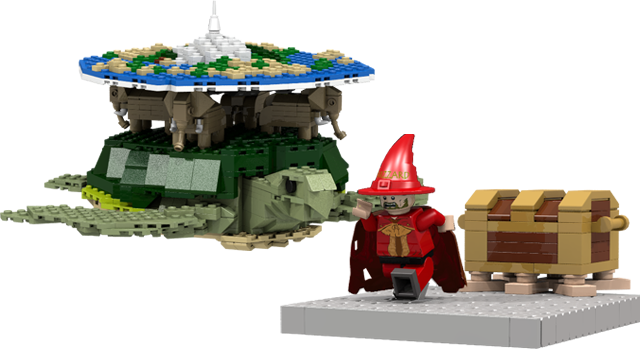 Also I just not willing to post my MOCs anywhere but Flickr. It's comfortable in many ways.